Considering Alloush and other senior members of the leadership of the Salafist militant group Jaish al-Islam were killed in a major airstrike carried out by the Syrian air force, there is undoubtedly going to be a transformation on the ground as initiative on the battlefield, particularly in Southern Syria, shifts still further to the Syrian Arab Army and its allies. With Alloush out of the picture and, based on reports coming from sources inside the opposition, significant disarray at the uppermost echelons of leadership of the barely cohesive “Islamic Army,” it seems clear that the Syrian government is likely to move in to reestablish control of Douma, Ghouta, and other rebel-held suburbs of Damascus. However, while many international observers lament the loss of this “iron-fisted leader” less than a month ahead of planned peace talks set to take place in late January 2016, nearly all analyses of this development have failed (deliberately omitted?) to elucidate just what the rebel groups under his command were doing in Ghouta and Douma, the nature of the ongoing war within the war between the Syrian military and the factions in control of these key suburbs, and the propaganda about the key strategic corridor and the events that have taken place there, including the infamous “Douma market attack” of August 2015 (which I debunked here). By examining the wealth of information about Alloush, his ideology, his organization, and their activities in the rebel stronghold suburbs of Damascus, it becomes clear that the airstrike that ultimately killed him and many of his Salafist comrades did far more than simply kill a leader of an important rebel group. Rather, this was a monumental, and perhaps mortal, blow to an entire segment of the rebel-terrorist coalition fighting against the Syrian government and people. In the days since Alloush’s death there have been, rather predictably, numerous articles written about the assassination, nearly all of which portray Alloush as something of a ‘moderate,’ a man who by the sheer force of his personality and will led an armed faction which stood as “defenders of the true revolution” in their steadfast opposition to both Assad and the Islamic State. One could be forgiven for thinking that Alloush was a patriot doing his part to defend Syria from the Islamic State and the brutal dictatorTM rather than a vicious Salafist who committed countless war crimes against the Syrian people, among others. Mr. Alloush led the Army of Islam, a group that had recently agreed to participate in a political process seeking to end the five-year-old conflict…Analysts said the strikes were in keeping with longstanding efforts by the Syrian government and its allies to eliminate groups claiming to occupy a middle ground between Mr. Assad and the Islamic State. The efforts are part of a broader objective to improve Mr. Assad’s standing among Western governments, which despise him but also see the Islamic State as an increasing menace. Consider the implication of the phrase “groups claiming to occupy a middle ground between Mr. Assad and the Islamic State.” While this is classic corporate media faux-objectivity, the reality is that this is cleverly constructed misinformation designed to validate and legitimize an absolutely discredited notion, namely that there is a significant difference between the ideology of Alloush’s organization and that of the Islamic State (ISIS/ISIL). Indeed, the NYT here is unsurprisingly bolstering official Washington’s line that the US must support “moderate opposition” which, in the subtext of that phrase, is everyone who is not ISIS/ISIL. But real experts on Syria recognize that this is merely political window-dressing, that in fact the difference between Jaish al-Islam, Ahrar al-Sham, Jabhat al-Nusra (Al-Qaeda’s official Syrian affiliate), and the Islamic State (ISIS/ISIL) is just words; these organizations compete for influence and control, but do not truly differ ideologically. Zahran Alloush’s rhetoric and propaganda videos provide much insight into his world view, attitude toward Syria’s religious minorities, and vision for Syria’s future. The difference between his ideology and that of al-Qaida groups is not profound. Rather, it is one of shades of grey. [The video linked in the article] is an anti-Shiite tirade and “bring-back-the-Umayyad-Empire” propaganda piece. It shows how sectarian Alloush is. He refers to Shiites, and reduces the Nusayris into this grouping, as “Majous”, or crypto-Iranians… Here it is an Islamic term of abuse meant to suggest that Alawites and Iranians not only have the wrong religion but also the wrong ethnicity—they are not Arabs, but crypto-Iranians…[This] demonstrates how demonized the Alawites are in the propaganda of the new Islamic Front. Zahran calls for cleansing Damascus of all Shiites and Nusayris… On hearing this sort of talk from the leaders of the revolution, Alawites and other non-Sunni sects worry that their struggle is a fight for their very existence [emphasis added]. This video and the language of Alloush demonstrates [sic] how difficult it is to draw a clear line between the ideology of the Islamic Front and that of the al-Qaida groups [emphasis added]. They both embrace foreign jihadists and encourage them to come Syria to join the fight. They both call for the resurrection of an Islamic Empire and they both look back to the Golden Age of Islam for the principles upon which the new state will be founded. Their political philosophy and blue print for the future is largely based on a similar reading of Islamic history and the Qur’an. Of course, rhetorical flourishes aside, the question of actual crimes committed by Alloush and his jihadi comrades is critical to examine. In late 2014 and early 2015, Alloush commanded Jaish al-Islam to fire rockets indiscriminately onto Damascus, a blatant war crime. Many Syrians were killed in these attacks. It is important to note that while the pro-rebel media outlets would make an equivalence between such attacks and the infamous “barrel bombs” of the Syrian Arab Army, the reality is that these are simply not comparable. The aerial offensives carried out by Syria’s air force have targeted rebel strongholds with clear military and strategic targets, while the Jaish al-Islam rocket attacks were fired at civilians without any specific targeting. This is not to say one has to sanction the SAA’s tactics, just to understand the difference between them and those used by the rebels. Whether one wants to use this to absolve Assad and the Government of blame or not, the inescapable fact is that bombardment by the military was never indiscriminate. By contrast, the purpose of Alloush’s bombardment of Damascus was solely to inflict terror on the population of Syria’s capital, and to take revenge for attacks carried out by the Syrian armed forces. Charles Lister, a vehemently anti-Assad analyst with the Brookings Doha Center, noted in a tweet that referenced an announcement by Alloush via twitter, that “Jaish al-Islam has begun a massive mortar & Grad rocket attack on central #Damascus, to ‘cleanse the capital.’” Indeed, the use of the word “cleanse” is instructive as it illustrates the attitude and ideology of Alloush as it is practiced on the battlefield. His desire to ethnically cleanse Syria was never mere rhetoric. Any way you slice it, Alloush and Jaish al-Islam committed this act that constitutes a war crime. Interestingly, Alloush’s ideological and rhetorical brotherhood with the Nusra Front translated into on-the-ground collaboration, particularly at the infamous massacre in the Damascus suburb of Adra. While pseudo-alternative media propagandists such as James Miller at The Intercept callously claimed that no massacre occurred at Adra, instead claiming that RT and other non-Western media that reported it were simply spreading disinformation, Miller and his ilk’s attempts to cover up what truly happened fell flat. Accounts of what happened to the rest of the population of Adra are confused. I spoke to some of the 5,000 refugees who had been allowed to leave by Jabhat al-Nusra and the Islamic Front on 30 December and some of whom are now squatting in a giant cement factory. They said the jihadis had ordered them to their basements and had kept them there. The number singled out for execution is put at between 32 and 80. There are accounts of the doctor in the local clinic, a Christian known locally as Dr George, being decapitated. Bakery workers who resisted their machinery being taken away were roasted in their own oven. Jabhat al-Nusra and Islamic Front fighters went from house to house with a list of names and none of those taken away then has been [sic] since. This includes the head of the legal department at the Information Ministry who disappeared with his wife and daughter and whose phone is now being answered by a man saying he belongs to Jabat al-Nusra. Such egregious war crimes and crimes against humanity are par for the course for Jaish al-Islam. In early November 2015, just weeks before Alloush was finally killed, Jaish al-Islam made international headlines after parading caged civilians through the streets of Ghouta, with cages of women being placed atop the organization’s headquarters and other key buildings to act as human shields against possible Syrian or Russian airstrikes. Their terrorist credentials are further bolstered by the dastardly role they played in the chemical weapons attack, and subsequent attempts to derail the dismantling of the chemical weapons stockpile by the Syrian Government. Even if one were to dispute the very provocative alleged video evidence (here, here, and here with excellent, balanced analysis here) of Alloush’s Liwa al-Islam (his organization before consolidation as Jaish al-Islam) there are clear and unmistakable connections between Alloush and the entire chemical weapons saga in Syria. The Syrian improvised chemical munitions that were used in the August 21 nerve agent attack in Damascus have a range of about 2km…[The evidence] indicates that these munitions could not possibly have been fired at East Ghouta from the ‘heart’, or from the eastern edge, of the Syrian Government-controlled area shown in the intelligence map published by the White House on August 30, 2013…The UN independent assessment of the range of the chemical munitions is in exact agreement with our finding. Several commanders of al-Qaeda brigades in Syria have stated that Zahran Alloush receives his orders directly from Saudi Intelligence. Russian diplomatic sources stated… that people of many different political observances have provided information to Russian diplomats. Statements to the effect that Zahran Alloush receives his orders directly from the Saudi Intelligence are corroborated by the fact that both Alloush and the Liwa-al-Islam are financed by the Saudi Interior Ministry. The group was literally established with Saudi money after Alloush was released from prison in 2011 [just weeks before the first unrest in Syria began]. According to international law, this fact alone is sufficient to designate Alloush and the Liwa-al-Islam as Saudi mercenaries. There was an obvious direct line between Riyadh and Ghouta with Alloush and his organization. That line has now been permanently severed with his death and those of other key figures of the organization. This will have major implications for the future of the war in Syria, especially with the beginning of a peace process coming at the end of January 2016, less than four weeks from the time of publication. Part Two of this article will focus on the implications of Alloush’s elimination for the future of this war. How will this major setback for the rebel/terrorist factions impact any negotiations? How will it affect the military situation on the ground? 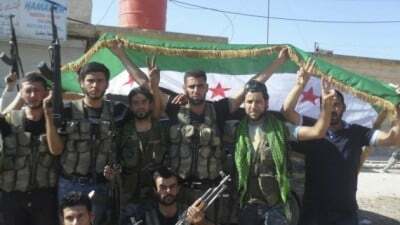 The article will also attempt to place into a broader narrative the “war within the war” between the Syrian military and the Alloush-led rebel groups in the Damascus suburbs. For now, one thing is certain: this assassination marks a major turning point in this bloody, nearly five year old war.